This year, our union, United Academics of OSU, will engage in negotiations with the administration to produce our first collective bargaining agreement. Our negotiations will be a frank, robust, and collegial exchange of views on solutions to the problems we face as a faculty and as a university. Faculty Voice: The collective bargaining process empowers faculty with a voice in the terms and conditions of our work and sets up a regular process for revisiting and refining those conditions. We will work to create true shared governance at OSU by strengthening the role of the Faculty Senate, protecting academic freedom and intellectual property rights, and providing for greater faculty inclusion in unit-level shared governance. Transparency: We aim to establish a grievance procedure that ensures the fair and equal application of unit, college, and university policies and rules. We will fight for clear standards and procedures for promotion and tenure that, alongside annually-updated, accurate job descriptions, provide a transparent basis for evaluation of faculty. Stability: Ensuring longer-term contracts, more advanced notice of reappointment, and pay increases that keep pace with the rising cost of living will provide faculty with the stability necessary to best perform their teaching, research, service, and community engagement work. We will work to secure bridge funding to stabilize research positions in the face of funding insecurity. Recognition: We will work to increase merit raises and professional development funding to fully recognize the extraordinary work of OSU faculty and the value of investing in continued excellence. 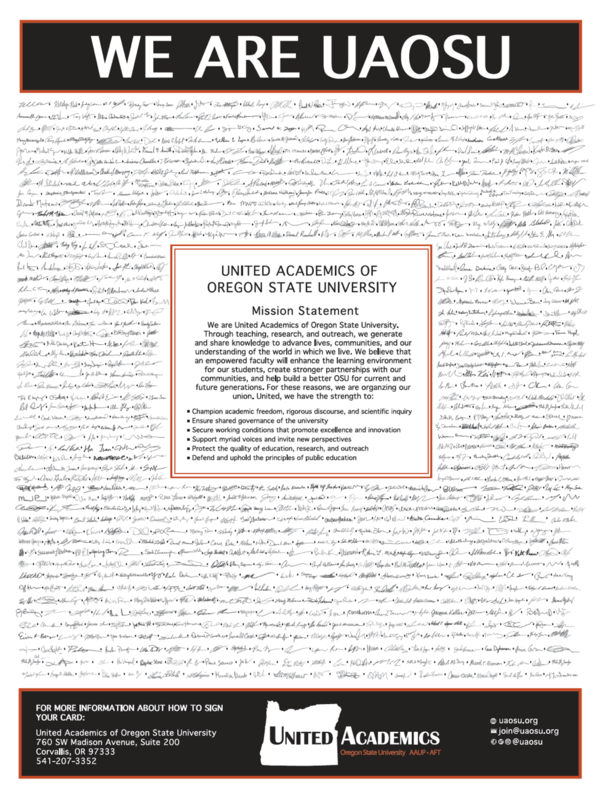 We will negotiate a contract that acknowledges and speaks to the unique needs of faculty who work at OSU campuses, offices, centers, and stations across the state. We will fight for facilities support, access to shared governance structures, and promotion policies for remote faculty that are commensurate with those for faculty on the main campus. Equitable & Inclusive Employment: We seek to make OSU a more equitable and inclusive place by securing equity raises to offset inequitable pay differences, enhancing family leave, investing in child care, and allowing faculty to transfer unused sick leave to those who need it. We will secure enforceable protections against discrimination and sexual harassment. Research Support: Faculty deserve appropriate support for the high caliber research they conduct. We will work to increase research support through the creation of bridge funding, prioritization of facilities maintenance, increased transparency as to collection, management, and distribution of grant overhead funds, and greater financial and administrative support.